Situated a mere kilometer away from the most popular beach in Phuket, Nai Harn beach, Villa Gemstone is a contemporary holiday home with four bedrooms for the adventurous travelers. 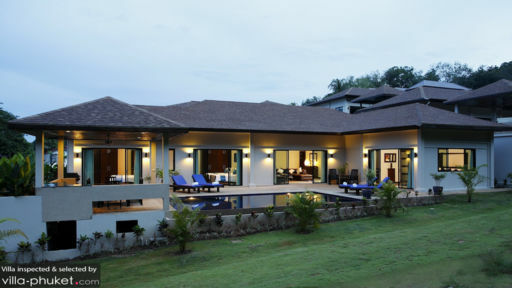 The beautiful property speaks to its natural surroundings with a private swimming pool amidst tropical vegetation. Excellent services and amenities make your stay ten times the better for it, since you don’t have to worry about a thing save for sunscreen and your next cocktail! Villa Gemstone boasts of four, well-furnished bedrooms that have been designed in a way that suits both adults and children. While the master bedroom is furnished with a king-sized bed, it has glass doors that lead directly to the pool and tropical gardens. Enjoy the stunning view straight from your comfy bed, as you bask in the tranquility of the area. An en-suite bathroom is spaciously laid out with a walk-in shower and a bathtub. The second bedroom is also furnished with a king-sized bed and has large windows for ample sunlight as well as sliding doors that lead to the pool deck. The bedroom shares a bathroom with the third bedroom, which is furnished with twin-beds. The last bedroom of the villa is, in fact, furnished with bunk beds, with a lower queen-sized bed, and a single top bed. It has an en-suite bathroom with shower and bath! The entire villa is located around the swimming pool, which has a wet-edge for an infinity style. Relish the open air and the tropical sun as you take in your calming surroundings and relax beside the pool on the sun deck. Sun chairs have also been kept for your interests, so that you have ample space to enjoy yourselves and rest up! Lush greenery grows all around the periphery of the villa alongside the walled-gardens so you have your own little oasis in the middle of the island. A traditional shingled-sala comprises a dining area and BBQ, where guests can indulge in dining alfresco under the stars, engulfed by the fresh, tropical air. The poolside living area is another modern alcove, furnished with leather couches, a 50-inch flat-screen TV, DVD player, and elegant ottomans to give you a comfortable space to lay back on and feel instantly rejuvenated. The false ceiling is fitted with point lights that create a luxe and cozy ambiance inside the living area, so while you lounge on the sofa and gaze outside through the sliding glass doors, your minds will feel at ease and relaxed. 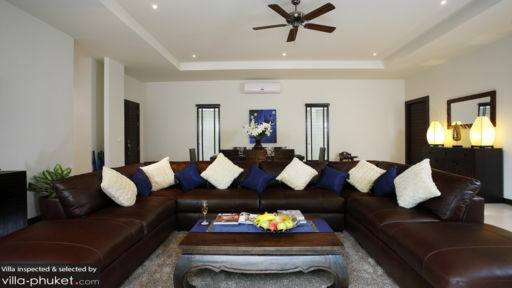 The living area is air-conditioned for a cool and soothing vibe during hotter hours. It is minimally decorated for ample space and more room to move around. Another indoor dining option is available to guests of Villa Gemstone with a ten-seater dining table towards the end of the living area for a nice, hearty meal with family and friends. The western kitchen is fully-equipped and ready for use with all modern amenities for you to make good of while you prepare delicious meals! There is an island countertop as well, along with barstools for guests to enjoy a few drinks and chit-chat with loved ones. The villa offers numerous services to guests, in order to make their stay a memorable one. There is daily housekeeping facility, child-friendly amenities, BBQ, a 24-hour helpline in case you need anything, and much more. Locate 1km away from the renowned Nai Harn beach, the location of Villa Gemstone could not be more ideal. Nai Harn beach is a stunning stretch of sandy shoreline and dazzling ocean with a lagoon, suitable for beginner swimmers or children. There are many shops, attractions, and locally-served restaurants in the vicinity of the villa as well.